What I need to know is what do I have to do so when I click on one of those buttons it will take me to that page, or rather scroll down to that section of the website? You will have to use an a tag that links to your div. For example: <a href="#portfolio">Click to go to my Portfolio</a> and somewhere else on your page you should have a div (or another element) with an ID of portfolio (or anything else you want, matching the href="#[ID-of-element]" part). 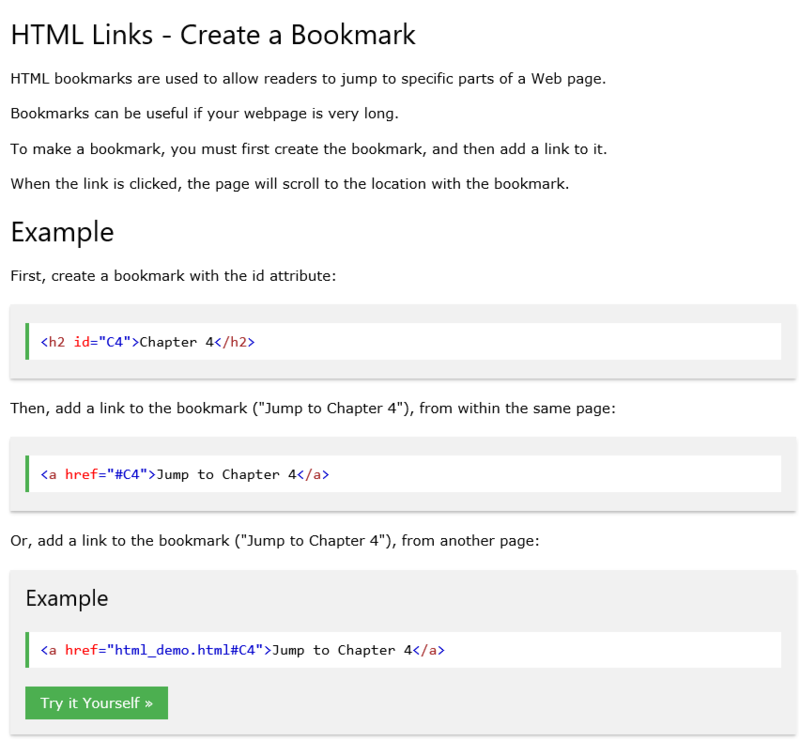 Check the “Creating a Bookmark” section from the link above. Here’s a screenshot below. So, all you need to do is create some content in your page and give it an ID attribute. Then provide the ID value in the anchor tags in your navigation menu. Thanks for the feedback I will try this now. Yes, this should be correct. Is there now something I have to do in CSS? Do you have a CodePen? Or could you copy your code? this is the link to my code pen. Very basic at the moment. In HTML, any tag that applies to content must enclose the content to which it applies. So <h1>sometext</h1> will make sometext a heading, but sometext<h1></h1> won’t. You have your <a> tags, but they enclose zero content, so the clickable area is zero pixels. You’ve used the id attribute on the buttons themselves, so the links point back to the buttons, not content on the page. Styles, metadata, etc. should go inside the <head> tag, not <header>. <header> “represents a group of introductory or navigational aids” (source). Codepen treats everything you type in the editor as <body> content anyway (click “Settings” to add <head> content). A minimal HTML document, meanwhile, consists of <!DOCTYPE HTML><html><head></head><body></body></html>. @djebar-fermas Thank you for the help. I will try it later on this afternoon. Don’t know why i am battling with this. Wow Awesome. Thank you for that.